Though it is now officially day three of the dig, it was, for all intents and purposes, day one of the actual digging. We are now beyond the winter wash and into the layers that we wish to save and study. The day began with the construction of our shade over Area M. The shade netting, which we repaired from the previous season’s holes yesterday, had to be stretched over the area and tied off along the fence surrounding it. We then set some support poles in place to make the shade more taut. Below is a picture of the shade now covering the dig area. 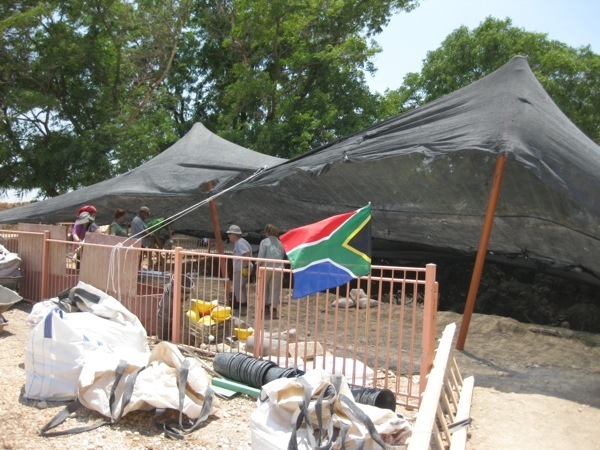 Don’t be too baffled by the South African flag; nearly half of our excavation group traveled from there. I was assigned for the day with a handful of people from South Africa to a section within Area M referred to as the “plaza.” This section has baffled the dig directors since last season, when a relatively early mud-brick hut was uncovered in a higher layer of an adjacent section. 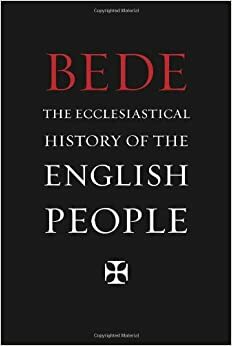 This is problematic because a general rule of archaeology says that the deeper you dig, the deeper you go back into history. However, the opposite seems to be the case in this “plaza” section: it has showed signs of being later (more recent) than the surrounding areas which are above it. The question is: how much later? The dig directors were adamant that any Iron Age materials found in this section would be very problematic, causing us to jokingly say, with our novice knowledge of prehistoric pottery, that every new find displayed Iron Age characteristics. Here is the vicinity of my Area M section. More specifically, I worked today mostly in the upper right quadrant of this photo. The general method of digging today involved picks, hoes, shovels and buckets. 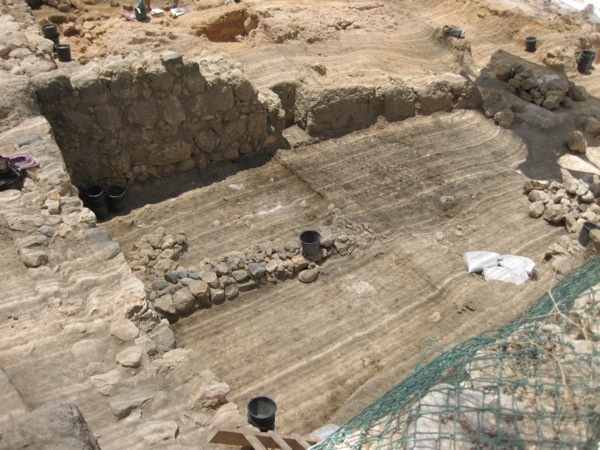 We took off a layer five centimeters (two inches) deep from our section, being sure to collect all the pottery and bones from our section in a pre-defined bucket, so that it could later be studied and easily connected to the place in which it was found. Five centimeters may not sound like much, but collecting the artifacts and disposing of the common dirt mix from five centimeters, when multiplied by the entire Area M, will consume an entire day. Because this was the first “actual” day of digging, it was the first day of pottery washing. Thus, when we cleaned up the dig area, we relocated to a new place under some trees to wash everything we had found during the day, per the normal routine. 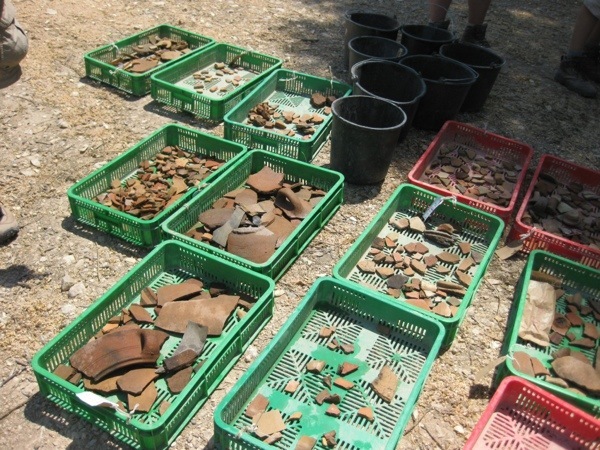 These pottery crates include most of the finds by the dig group today. Thus ended our day, and we were soon after bussed back to the kibbutz from the tel. As for now, I must get something of a nap, because tonight we will have our first evening lecture, followed by a Euro 2012 football match that I hope to stay awake for. Day three of fifteen, complete! Good read Rob. Sounds like you are really enjoying what you are doing. So interesting. Be safe, and we love you.